Our Motto: For each application the correct compound! Due to the new premises opening at the start in 2004 and 2009 we could realise in our factory all production processes and material flows according to the most modern technology. This is the key for economical production on a high quality level, combined with committed and highly qualified personnel as well as the selection of high quality raw materials. 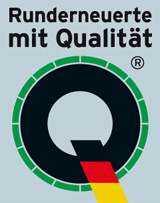 Raw materials and suppliers are homologated only after an intensive examination. Each type of raw material has to pass an extensive verification in our laboratory as well as in production tests before it is allowed to be used in series production. We have high requirements to our suppliers reg. reliability, service and their quality level. The mixing department is the heart of our rubber company. Here we produce not only compounds according to customers specification for tyre retreading or for other technical use but also compounds for our PRL- and KONTUR-treads. After the investments in 2009 we are equipped with the most modern machinery. The process is of course computer controlled and checked online in order to guarantee the production of the compound exactly according to the specification. We produce a large variety of different compounds according to our motto: "For each application the correct compound!" The next production step is the extrusion. Due to a modern Pin-convert-Extruder it is possible to use for each compound an optimum machine parameter and nevertheless to reach a high output. As well as uncured blanks for the presses we produce camel back, extruder strips and stripwinder. In the press department our PRL- and KONTUR-treads are vulcanised. The final production step is buffing and cementing of treads, so that they are ready for use. Orders of our customers are delivered shortly from our well assorted stock.